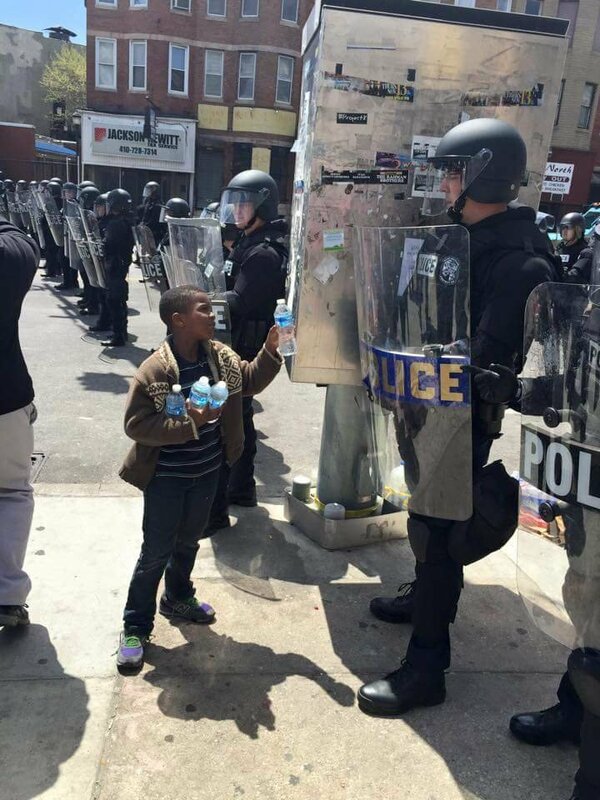 This photo of the little boy offering water to the police forces is none other than heartwarming to see. A sight to see and one to take into our hearts and minds of the day. Not all Black people are bad and not all police are racist. The heartwarming image is reminiscent of “Flower Power,” the iconic 1967 photograph of a Vietnam war protester placing a carnation in the barrel of a National Guardsman’s rifle. Just one day earlier, though, Baltimore looked more like 1968. Violence ravaged the city Monday evening following the funeral of Freddie Gray — the 25-year-old who died from a spinal-cord injury in police custody earlier this month — with looting, burning, smashing and rock throwing carrying on well into the night. Governor Larry Hogan declared a state of emergency and, for the first time since the riots sparked by Martin Luther King Jr.’s assassination 47 years ago, the Maryland National Guard was deployed to help city and state law enforcement quell the chaos. Let this be a symbol of humanity at it’s absolute finest and most innocent.